Welcome to Bigroads.com's guide to whitewater rafting in the USA! A good chunk of the U.S. population will take a whitewater rafting trip at some point in their lives, and nearly all will forever remember it fondly. What many people may not realize is that the United States is chock-full of great rivers to raft. In fact, some of the best and most thrilling rafting adventures on the planet are found in the USA. Full day rafting trips typically cost in the $75-$150/per person range, with the rate mostly depending upon the specific river and location. Multi-day expeditions are much more expensive, often costing many hundreds or even several thousands of dollars. However, multi-day trips offer an unparalleled river experience and are usually well worth the cost. If you are looking for a "once in a lifetime" sort of trip, a long rafting journey on rivers in states like Idaho, Oregon, Utah and Alaska should suit you quite nicely. OARS is probably the premier rafting guide company in America, but there are literally hundreds of rafting guide companies across the United States to choose from, with many offering a variety of half day, full day, and multi-day trips, usually on several different rivers in their local region. We have listed OARS and several other outstanding guide companies on this page based on personal experiences and online reviews from websites like Tripadvisor and Yelp. We do not accept paid advertisements on Bigroads.com, so all recommendations we make are sincere. Presented below are the major whitewater rafting rivers that are commercially guided in the United States, along with their rating (class I, II, III, IV or V), duration, season, and some general notes about the river or trip. This list intentionally excludes rivers that are not commercially guided (i.e. other rivers that are run by whitewater kayakers). Please email us @ gparsons66@hotmail.com if you believe we missed any of the major whitewater rafting rivers that are commercially guided in the USA, or if you have any other information you think we should include for any of the rivers presented below. Share this page / follow us on Facebook! For the ultimate in dramatic mountain and glacier scenery plus outstanding wildlife watching opportunities, look no further than whitewater rafting in Alaska. Alaskan rivers do present many challenges though: many rivers are glacier or snowmelt fed, and can vary widely in character based upon current water levels. Many trips also require a charter or bush plane flight (or two), and these flights don't come cheap. Logistical planning can also be challenging. And then there's the Alaskan grizzly bears and mosquitoes you've heard about. But if you desire the ultimate thrill that is an Alaskan multi-day rafting adventure (and you can actually afford it), this is one trip you should absolutely take. IV/V 5-6 days June to August 36-mile long trips appear to be the norm; "the crown jewel of remote Alaska white water rafting in Wrangell St. Elias National Park & Preserve"
Arizona offers the most famous whitewater rafting trip in the entire world: the Colorado River through the heart of the Grand Canyon. You don't have to take the full 18-day trip through the entire canyon, but it wouldn't be a bad idea. Some guiding companies offer short trips on the Colorado (some as short as 1-day trips). V 1-18 days April to October this is the most famous whitewater rafting trip in North America (and perhaps the world); many different trips and boat types are offered on this river; the longer trips typically offer some side-trips to ancient ruins, swimming holes and other sites; motorized rafting trips are also led through the Grand Canyon; there are some 1-day Grand Canyon rafting trips offered, but what's the point in doing that? California offers enough rafting trips to keep you satisfied for years. The South Fork of the American River is one of the most popular rafting day-trips in the USA. III/IV 1-2 days April to September typically run as a day trip, but an overnight option is available; has the "weirdest & wildest Class IV rapid in California"
IV/IV+ day trip mid-April to June prior rafting experience recommended; "non-stop action"
V day trip April to early June "an incredible and seldom run river with technical and continuous class IV and V rapids"
Colorado offers some of the most memorable rafting day trips in the USA, especially on various sections on the Arkansas River, which is one of America's most popular rafting rivers and offers over 60 miles of raftable water. Trips for the Arkansas River typically leave from either Buena Vista, Canon City or Salida. For more great information about rafting in Colorado, visit the CROA or Raft Colorado websites. II/III day trip May to September a 19-mile trip that is "great first-time rafting trip for families"
II/III 1-5 days May to early July trips typically start in Placerville (near Telluride); "one of the last free-flowing major rivers in the USA"
III/IV 4-5 days May to early-July this 48-mile trip passes through two states (Colorado & Utah) and Dinosaur National Monument; generally only class IV during the spring snowmelt; most trips are run by companies out of Steamboat Springs; "some of the most scenic class III-IV whitewater on earth"
Connecticut doesn't offer much in terms of whitewater, but the Housatonic River at the height of spring snowmelt can pack a nice quick punch. II day trip March to November 7-mile run along border of GA & SC; a U.S. "Wild and Scenic River"; the "crown jewel of southeastern rivers"
III/IV day trip March to November most popular section of the Chattooga River; runs along GA & SC border; a U.S. "Wild and Scenic River"; the "crown jewel of southeastern rivers"
IV day trip March to November some of the most intense rafting on the East Coast; runs along GA & SC border; a U.S. "Wild and Scenic River"; the "crown jewel of southeastern rivers"
Idaho is world-famous for its multi-day rafting expeditions that pass through some of the deepest and most scenic canyons on Earth. Trips down the Snake and/or Salmon Rivers should be on everyone's bucket list. ROW Adventures and OARS are considered two of the premiere commercial guides in the state. III/IV 5-6 days June to September 100-mile trip; the most intense rafting on the Salmon River; some of the finest whitewater rafting in the USA; world-famous; "rafting doesn’t get any better than this"
Maine offers three rivers for whitewater rafting, and it's tough to pick a favorite because they are all a blast. Both the Kennebec and Dead Rivers are run by outfitters that are based off US 201 in or near the town of The Forks, whereas the Penobscot River is run by outfitters out of the Millinocket area. If you are looking for a family-friendly trip, the Kennebec can't be beat. For scenery, the Penobscot River is king. Our favorite commercial guide in the state of Maine is Northern Outdoors (mostly because they have a wonderful lodge, a microbrewery, and plentiful cabin rentals) in the town of The Forks. In addition to Northern Outdoors, NEOC is another highly recommended Maine guiding company. IV day trip May to October run May through October; the most fun family-friendly rafting in New England; includes a swimmable section; look for "high release" dates if you want more exciting rapids. While the rivers of Massachusetts aren't quite as wild & crazy as the far more famous whitewater rafting rivers of Maine, they are still very much worthy of a run. Zoar Outdoors and CrabApple are the premier rafting guide companies in Massachusetts. Much of the whitewater rafting action in Montana is centered near Yellowstone National Park. The Montana Whitewater Raft Company is perhaps the premier rafting guide company for the three raftable rivers near Yellowstone (the Yellowstone, Madison & Gallatin Rivers). Rafting in New Mexico is primarily focused around the Rio Grande River. Los Rios River Runners is a fantastic New Mexico-based guiding company. New York offers four rivers for whitewater rafting, and all are located in the upper regions of the state. The best rafting is typically found during the spring snowmelt season, but all three can normally be rafted throughout summer and early Fall. Oregon offers some of the finest day and multi-day rafting trips in the United States. A highly recommended guide service that runs several different rivers in Oregon is the Northwest Rafting Company ("NWRC"). IV 1-3 days May to October a 2 or 3 day trip will cover about 40 miles; a "Wild and Scenic River"; "one of the most impressive gorges in the west"
II 4-5 days April to June a designated "Wild and Scenic River"
IV+ 3 days late-March to early-May "some of the biggest rapids in the Northwest"
III/IV day trip March to October most popular rafting section on the "Yough"
The Chattooga River begins its journey in North Carolina and actually creates the border between Georgia & South Carolina. 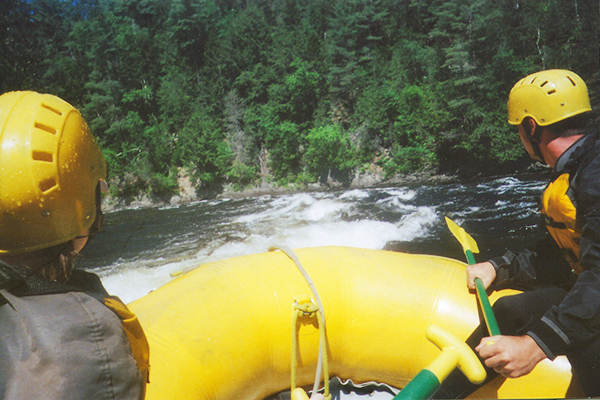 There are several different sections that can be run on this classic rafting river. Tennessee offers the Ocoee River, which is one of the premier (and most famous) whitewater rafting day trips in America. Many different guide companies provide trips of various lengths and difficulties. III/IV 1-2 days early-March to mid-June 25 named rapids from class II-IV; "one of the top rafting adventures in the East"
IV/IV+ day trip weekends only; mid-May to mid-September 10 mile trip combines Upper & Middle sections; "the finest full day of continuous Class III and IV whitewater action in the Southeast"
The Rio Grande offers the best whitewater rafting within the state of Texas, and trips last anywhere from one to six days in duration. There are a few other rivers in Texas than can be rafted, but they are often heavily water-level dependent and many of these rivers don't have any formalized commercial guiding operations. (but best in winter/spring) this 36-mile trip is best in winter/spring (summer = too hot); "more renowned for its scenic beauty than for a technical, bumpy ride"
Utah is perhaps more famous for its relatively gentle float trips than for its whitewater adventures. However, there is still some intense rafting to be found, especially in Cataract Canyon along the Colorado River. If you enjoy multi-day rafting expeditions, you'll find some of the best trips in the USA in Utah. III day trip May to September offered by Don Hatch River Expeditions; appears to be 100% in Utah but perhaps a portion is in Colorado? The West River is the only commercially guided rafting river in Vermont, and even then, it's only run on limited spring and fall weekends. per year mostly class III rapids; limited release dates (typically one weekend in late April/early May and one weekend in late September/early October); Zoar Outdoors and CrabApple are two highly recommended guiding companies. IV day trip April to July class depends heavily upon water levels; "the only whitewater rafting through a major U.S. city"
II day trip April to July class depends heavily upon water levels; "the only whitewater rafting through a major U.S. city"
IV day trip April to July combines both the Lower & Upper sections; this trip is sometimes called "Falls of the James River"
Washington offers a strong variety of full day and half day rafting trips. The commercial guide River Rider offers a variety of day trips on several rivers in Washington. West Virginia's whitewater rafting is infamous, mostly because of the fall season trips on the Gauley River. If you want to raft the Gauley, make reservations as far in advance as possible. Here are the top 10 whitewater rafting day trips in the United States. In full disclosure, it was difficult to make such a top ten list, because how can you really compare one river to the next? Anyway, here's the list. Take note that we have intentionally excluded the class V/V+ extreme rafting trips that require strong skills/experience (like Cherry Creek in California). These multi-day rafting expeditions are world-class. Take at least one of these trips at some point in your life (preferably sooner rather than later because you may discover you want to do more). Please help support the future growth of Bigroads.com by making all your Amazon.com purchases through this link. It doesn't cost you any extra, and we earn a referral fee for all purchases that you make, no matter what you buy. Travel & outdoor activities can be extremely dangerous. Use of this website and all of its information is at your own risk! We strongly believe in personal responsibility when it comes to staying safe. We will not be held liable for any injuries and/or death that occur.